In Mikhail Afanasievich Bulgakov’s world-class novel, The Master and Margarita, Woland (aka the Devil) gives to our heroine Margarita a diamond studded golden horseshoe. The gift is a reward for Margarita having displayed exemplary courage and a royal demeanor while performing the duties of hostess for the Devil’s Grand Ball. The latter, entitled as "Satan's Rout" in the novel, introduces the reader to a rather wide assortment of unsavory and ultimately doomed individuals. Following the ball, and in a spirit of appreciation, Woland offers the gift to Margarita as "a souvenir." She is reluctant to accept it, but Woland gently insists. Margarita does in fact leave his abode with the horseshoe, but somehow manages to momentarily lose it on the way to her waiting transportation. The horseshoe is quickly retrieved, however, by one of Woland's faithful companions who describes the horseshoe as "dear to me as a memory." Really? A horseshoe? A gift to be treasured as a memory? One is immediately struck with the idea of this particular gift. Assume, for example, you wanted to honor some lovely woman with a present, the kind that will make her very, very grateful. You know the kind. Clearly, if your gift was one of gold and studded with diamonds, it would almost certainly be well received. Any woman would love that kind of thoughtfulness on your part. Gold and diamonds are always nice. But in the shape of a horseshoe? Are you kidding? Like, did you think she needed to be shoed? Really... what were you thinking?! But perhaps... just perhaps... there is method to your madness. Maybe there's a bit more here to understand. After all, Mikhail Bulgakov is clearly not an author who would be careless in his use of symbolism that did not come fully equipped with a deeper meaning. This would be especially true when it was included in his final masterpiece of writing -- the one destined to be the ultimate work of his literary career. Accordingly, it might be appropriate for us to dwell upon this subject a bit longer. In fact, it is very likely that a treasured trove of deeper insights awaits us... but for the asking. It's a good story, and amply illustrates the notion that something as mundane as a horseshoe (golden or otherwise) has notable powers of its own. Furthermore, from this perspective one can assume Woland was both rewarding Margarita for a job well done and simultaneously assuring her that she need never again fear having the devil at her door or crossing her threshold. She had done her duty as hostess of his ball in the best traditions of royalty -- "blood will tell" -- and therefore her stint was done. There need be no more obligations. It is also important to relate that Margarita’s name was and is connected with a French Queen, historically either Margarite de Valois or Margarite Navarre. Woland mentioned Queen Margarite's name, apparently because in her time she had also served as Ball hostess. Woland even made a point of saying that all of his ball hostesses were named Margarita or Margarite. Presumably, the name of the ball hostess and the gifts were traditions in and of themselves. We can also note in The Master and Margarita, that the golden horseshoe was diamond-studded... as if one wanted to add stars to the mix of gold, royalty and Margaritas. As it turns out, the constellation Corona Borealis -- also known as the Northern Crown -- is in the shape of a horseshoe. In addition, one of its brightest stars is called the Margarita Coronae, or the Pearl of the Crown. In effect, "Margarita" simply means "Pearl". At Satan's rout, Margarita was in fact obliged to wear a diamond crown, and was treated by everyone as French royalty. Inasmuch as "the word pearl has become a metaphor for something rare, fine, and admirable," it is clear that the heroine of Bulgakov's novel was well named. In other cultures, Corona Borealis was considered to belong, in a sense, to Boötes, the herdsman, or the keeper of the bears. The Cheyenne tribe called it "Camp Circle" as they arranged their camps in a semicircle. In Welsh mythology, the Northern Crown was called Caer Arianrhod, ‘the Castle of the Silver Circle,’ and was the heavenly abode of the Lady Arianrhod. Alphecca -- the "Pearl of the Crown" -- is at the center of the seven brightest members of the constellation, and in modern times is the one which has been called Margarita Coronae. Occasionally it is also referred to by the name of Saint Marguerite. Of particular note is the fact that the horseshoe shape is one of the most sacred in the ancient world. A stylization of the yoni, it signified entrances and exits in general, a concept glorified in numerous Druidic temples, Hindu and Arabic arches. The sacred alphabet of the Greeks enclosed all things between the birth-letter alpha and the horseshoe-shaped omega. The name of the latter means "Great Om", and represents the conclusion of each cycle, the other side of the Goddess, the Kali part of Kali-Maia. The Christian God's description of himself as 'the Alpha and Omega, the beginning and the ending' (Revelation 1:8) was usurped from older titles of the Mother of birth and death. The Omega connection goes back far beyond the mother and/or wife of Jesus, and is in fact very much a symbol of antiquity. It was taken over by the Christians probably to bolster their own faith. The Great Om concept clearly goes far beyond Christianity, and is more linked with the Great Goddess than any fledgling male upstart. If the horseshoe is hung with points up, the argument is that the luck won’t fall out. But if hung with points down, then the luck pours onto you and anyone else entering your dwelling. For those believing luck has no limits, the luck pouring down on all who pass across the threshold would appear to be far better than attempting to bottle up the Genie or contain the luck and store it away for a rainy day. 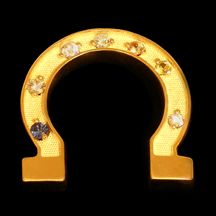 In all traditions, however, luck is contained or created in the horseshoe and can pour out through the ends. You know... this gift to your lovely lady is beginning to sound better all the time! Obviously, one is better advised to follow the Omega, to hang the horseshoe upright like a yoni and thereby not offend the Great Goddess -- a very unwise move in anyone's book. This would be the preferred route, rather than go the path of least resistance, hang on to the past, and keep the luck in the horseshoe bottled up as if you were a miser with a severe if not terminal fear of lack. The feminine yoni is also easily associated with the Goddess, Mary Magdalene, and/or the Holy Grail. This Grail connection may in fact be the reason for “The Knights of the Golden Horseshoe” expedition in 1716 in the British Colony of Virginia. The Royal Governor and a number of prominent citizens traveled westward, across the Blue Ridge Mountains on an allegedly exploratory expedition into the Shenandoah Valley. The fact that all of these well-placed individuals braved the wilderness speaks volumes, while the infamous partying going on was probably a ruse to confuse the uninformed. 1) The expedition celebrated its "arrival on the banks of the Shenandoah River with multiple toasts of wine, brandy, and claret" near Elkton, Virginia. If you look at a map of the Shenandoah River, you will see first a shape of the horseshoe near the confluence of the northern and southern tributaries, with Elkton located roughly at the furthermost southeastern portion of the southern branch. With the idea that the horseshoe luck bequeaths luck to those standing below -- Elkton might have seemed to be a great place for a party, religiously or otherwise inspired. 2) Elkton now boasts the fact it currently has U. S. Highway 33 running thru it -- "33" being numerologically the traditional number for Jesus Christ. 3) The place where the two tributaries join is near Riverton, Virginia (north of Front Royal, Virginia), and practically astride Interstate 66 -- or the meeting and combining of two "33's"? 4) The river continues toward the northeast, slipping into West Virginia until it reaches the confluence of the States of Virginia, West Virginia, and Maryland -- located at Harper's Ferry. Thereafter the Shenandoah flows into the Potomac, the latter which divides Virginia and Maryland (having its upstream version divide West Virginia and Maryland) until the river reaches Washington DC, a Freemasonry capital. Freemasonry has traditionally treated the "widow" and her son with great reverence. 5) The stickpins handed out to "each officer of the expedition" was made of gold and shaped like a horseshoe, and was inscribed in Latin, "Sic jurat transcendere montes", words which in English means "Thus he swears to cross the mountains". This phrase sounds very much like Freemasonry, where similarly sounding phrases are part and parcel of acknowledgement of the Widow's Son, and so forth. Curiously, 'transcendere' is translated as "cross", when it might more accurately mean "to surpass". 6) The word Shenandoah was derived from a Native American expression for "Beautiful Daughter of the Stars." 7) The sum total of these implications is that the expedition was strongly associated with the Holy Grail, with the emphasis being upon honoring primarily Mary Magdalene. These gentlemen might have in fact found The Da Vinci Code to be quite authoritative in its narrative. Obviously, Bulgakov had done his homework in the process of writing The Master and Margarita, as well as incorporating a great deal of profound symbolism in what could easily have been just a minor detail. That seems to be the way of the world when it comes to truly great literature. Things are never quite as simply as they may appear at first glance. Now, if you can just manage to encapsulate the above in a brief card to go along with your gift of a diamond-studded golden horseshoe to that lovely lady. Good luck. Meanwhile, your homework assignment is to read the novel and write an essay on the derivation of the name, Woland. Hint: What was Bulgakov's favorite opera? All such essays, comments, and asides can be communicated to the whole of the Halexandrian community by posting it at the Forums, under The Master and Margarita section. Taken from: Barbara G. Walker, The Woman's Dictionary of Symbols and Sacred Objects, Harper San Francisco, 1988. Debbi Kempton-Smith, Secrets from a Stargazer's Notebook, Bantam Books, 1982.